The kitchen is in many ways the most important room in your home. It’s where you cook fabulous meals for your family, and in many cases, it’s where the family gathers at the table to eat those meals. You may even sit at the kitchen table drinking coffee and contemplating life early in the morning. Because of this, it’s important that the kitchen is a room where you want to spend loads of time. Whether you’ve just purchased a new house and want to create the kitchen of your dreams, or you simply want to update the kitchen that you’ve had for years, there are a number of remodeling ideas that you can incorporate. And, they don’t have to cost a fortune. 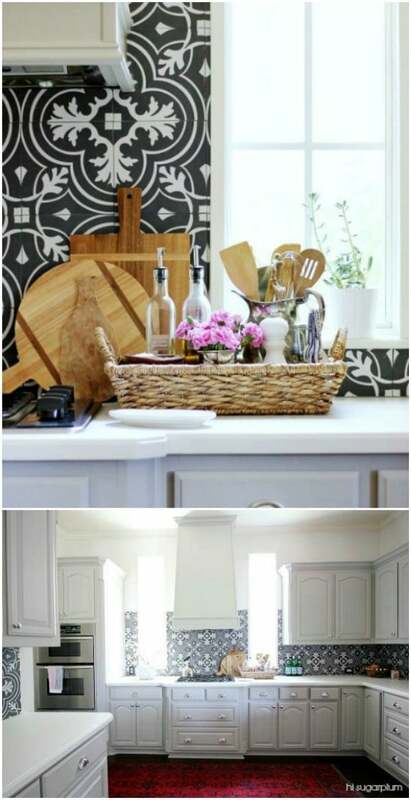 I’ve collected 25 wonderful ways to get the kitchen that you have always wanted, and many of them can be done with a very small budget. After all, DIY is what we do, and we’re going to use some great do-it-yourself ideas to completely transform your kitchen! While you’re remodeling your kitchen, be sure to also check out these 45 Brilliant Kitchen Hacks that will make your life much easier once that new kitchen is finished. Any chance to save time or money is a good opportunity, right? So, we’re going to take a look at some easy ways that you can integrate change into the kitchen. Again, many of these projects can be done with very little money, and they’re all DIY kitchen remodels, so you can do all of the work yourself. This saves money itself because you don’t have to hire a renovation crew to make the changes. If you’re ready for a true DIY kitchen makeover, this collection will be a real treat. I’ve also got a great collection of 10 Ingenious Kitchen tricks and tips to help you save on messes. Without further ado, let’s look at some wonderful ways you can DIY yourself a brand new kitchen! I’m a huge fan of the farmhouse style. I think every kitchen in the world should be comfortable and inviting, and farmhouse kitchens are the epitome of warmth. 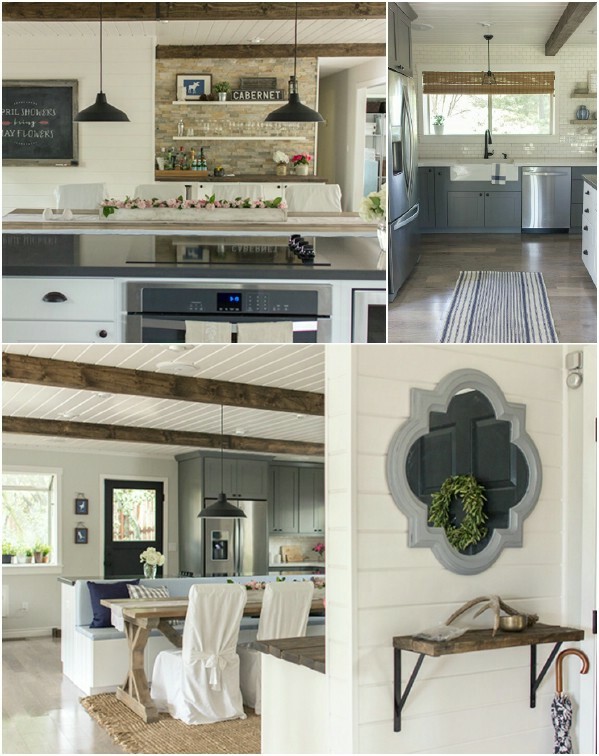 By painting cabinets slate gray, you can incorporate a great farmhouse look into your own kitchen, no matter how it’s laid out. Note the wooden beam across the ceiling, as well. This really lends to the farmhouse style and is really easy to accomplish. I absolutely love this bungalow kitchen look. The best thing about this design is the storage. I need so much storage in the kitchen, and if you do too, this is a great design idea. All the cabinets and appliances are white, which really gives the room a larger look. Plus, note that storage/bookshelf area at the end of the bar. Who wouldn’t just love to have a dedicated space for cookbooks? This beautiful white kitchen is made complete with a chalkboard wall. What better way to relay messages to the family or keep track of your grocery list? I adore the idea of an entire wall that I can write on. Plus, it would be heaven for kids or grandkids. I also love the rustic appeal that it gives the entire room, and it isn’t expensive at all. 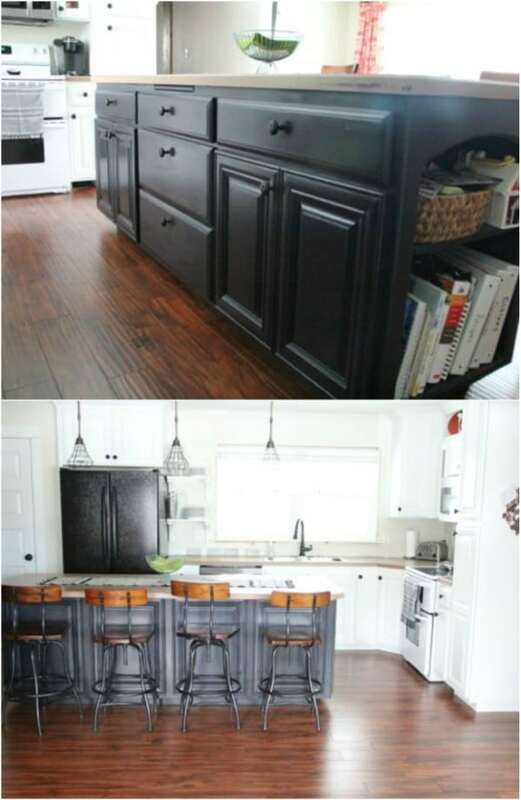 Just paint your cabinets white and then use a gallon of chalkboard paint to get the chalkboard wall. Sometimes all you need to completely change the look of a room is a new coat of paint. The gray and green in this kitchen work beautifully against white cabinets to transform the entire room into something elegant and classy. Note, if you don’t want to completely redo your countertops, you can paint them gray and even texture them however you want. Paint wooden cabinets white for this look – or anytime you want the cabinets to stand out against the backsplash. If you spend a lot of time in the kitchen, you want it brightly lit and efficient. This DIY remodel gives you both. It has an industrial feel with the stainless steel and the steel bar stools. You can accomplish the overall look even if you don’t have a bar or island in the kitchen. The idea is to add adequate lighting and even move things around a bit to make the room more efficient for when you are cooking. Again, white cabinets make the room look much larger and more organized. Again with the white cabinets…but we really do love how they look, right? This kitchen offers an offset of gray walls and a great gallery wall that instantly changes how it looks. I love the wicker chair in the corner with the grain sack pillow. It really gives the entire room a more elegant feel, and this entire kitchen can be completed for just a couple hundred dollars – mostly for paints and pictures for your gallery wall. This kitchen is really unique. Instead of uniform kitchen cabinet colors, the tops of the cabinets are painted white while the bottoms retain their wooden tone. 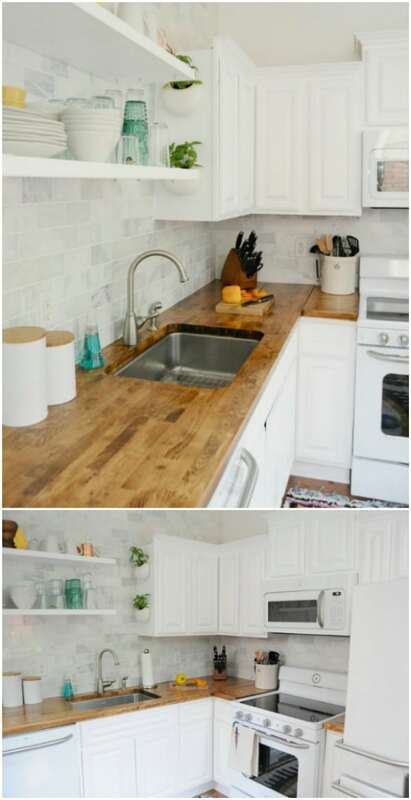 I love the white faux brick backsplash, which you can totally create on your own if you need to. The entire look of this kitchen is formal meets casual. It’s so different that you can’t help but love it. Okay, this is a wonderful way to really change the look of your kitchen. 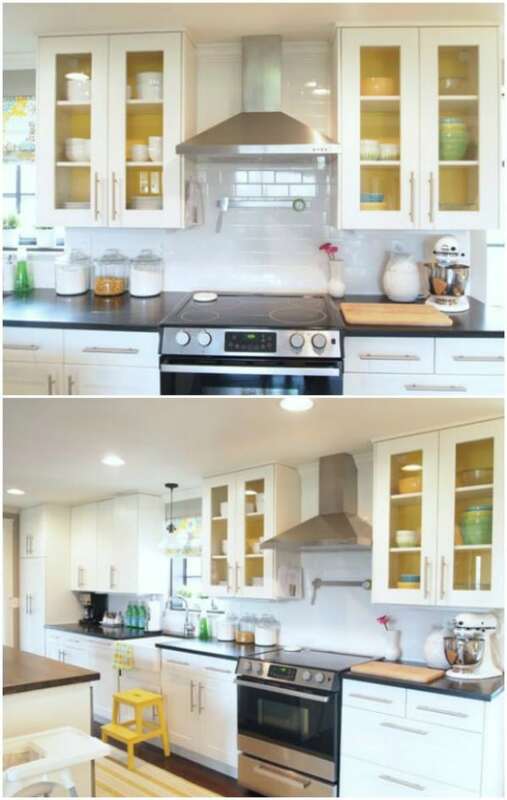 You can paint your cabinets white if they aren’t white already. Then just add splashed of color throughout to really make the room pop. The plants are wonderful additions and note the wooden top on the island. It’s also got really colorful dishes displayed throughout that instantly draw your eye. Kind of gives you a home on the beach feel, doesn’t it? 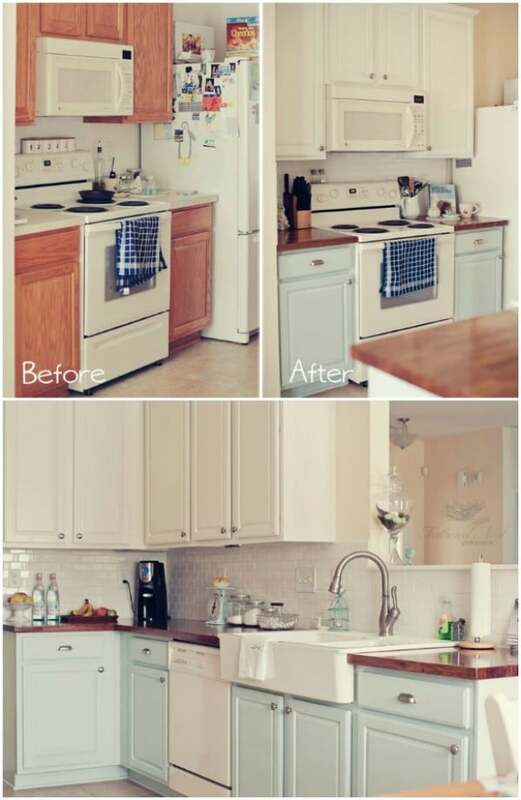 Changing your entire kitchen could be as simple as replacing old and outdated backsplash. While this particular look may be a bit daring, it’s wonderfully unique and gives the entire room a great vintage, elegant look. 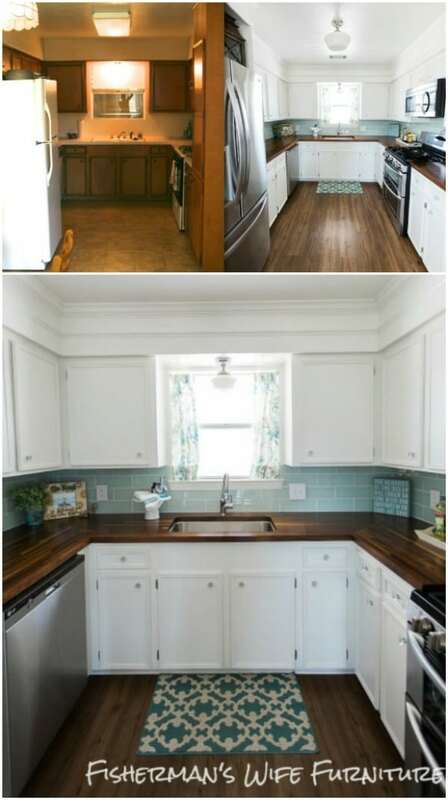 You can replace the backsplash for under $100, especially if you go with vintage wallpaper that you buy from a thrift store. Plus, this entire project will only take a weekend to complete. You could even paint or restain the cabinets to update them, as well. n typically get this material for a lot cheaper than many other countertops, and it gives the entire room such a warm and inviting appeal. I also love those open cabinet shelves to give the room farmhouse appeal. Speaking of open cabinet shelves, check out these great natural wood open shelves. Against white cabinets, they really stand out and give the entire room a great new look. You can so easily create these shelves yourself, and they’re the perfect way to instantly change the look of your kitchen. You can remove a top cabinet if you need to, or these are great shelves for any open areas that you may have. If you have cabinets with glass doors, painting the insides a bright color is a great way to add personality to your kitchen. I love this bright yellow in the kitchen, and it looks great against those white cabinets. Note that the kitchen island is also yellow, which really opens and brightens up the entire room. This is such an easy project – all you have to do is paint! FYI, the cabinets are from IKEA, so if you want to redo the cabinets you have, check those out. Who says your kitchen has to be white or wood? You can have any color that you want – this navy and brass kitchen is proof of that. Note how elegant it looks. The dark navy blue cabinets are not traditional by any means, but they are beautiful. Once you’ve painted your cabinets, just add brass drawer pulls and cabinet handles, which you can pick up at any home improvement store. You can also save money by purchasing cheaper hardware and painting to give them that brass look. Okay, so this one is probably my favorite. I love cooking and I adore reading, so this kitchen is my dream! If you have additional space at the end of the kitchen, create a comfy little reading nook. You can store your cookbooks in the bookshelves and this is a great place to relax with a good book and cup of coffee on those cold winter mornings. Black and white contrast each other beautifully. Replacing your countertops with black marble, or painting them black if you really want to save money, will instantly transform the look of your kitchen, especially when you pair those new countertops with white cabinets. The entire look is clean and sort of reminds you of a 50’s diner, doesn’t it? You could also add black and white tiles if you really want to make a statement, but I think wood flooring is best with this look. Did I mention my dream is to live at the beach? 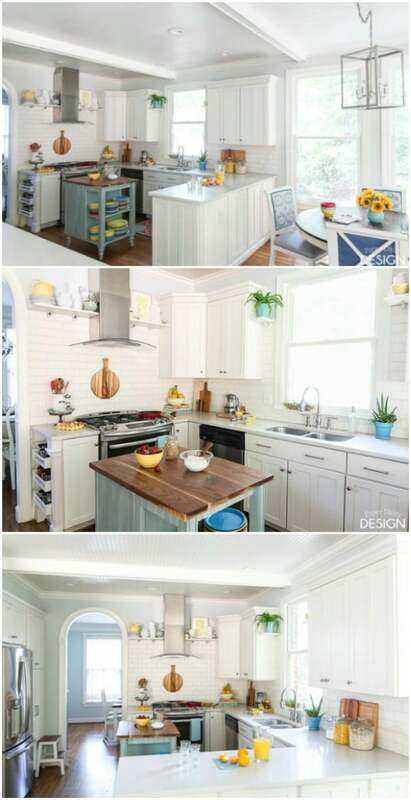 Well, it is, and this coastal inspired kitchen may be my next big project. 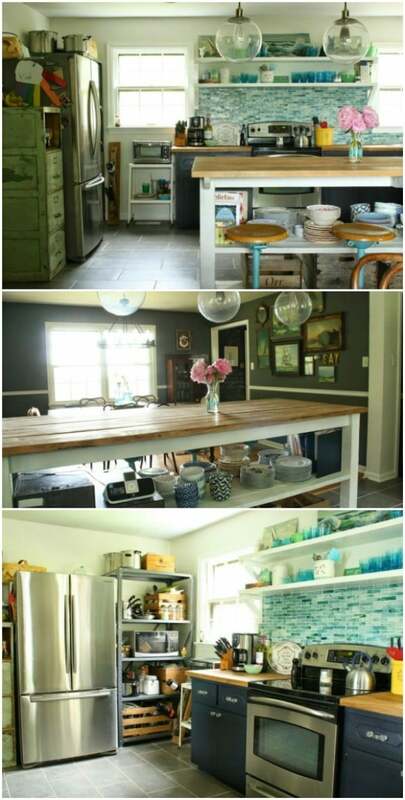 I love the colors and this is an easy kitchen remodel to pull off. You’ll need to replace the backsplash with a warm aqua color and then just add that color throughout the kitchen. Note that huge open shelf above the stove with pictures of the sea. This entire kitchen is beautiful and really easy to get. Again, painting your kitchen cabinets different colors is completely acceptable, and an excellent way to remodel on a budget. Paint the top cabinets white and the bottoms this lovely pastel blue. This is a really great, clean look, especially with those wooden countertops. This one also has a bit of a coastal feel. You can get this look in a weekend and it won’t cost much since all you’re really buying is paint. No matter what your kitchen looks like now, this cottage style kitchen will be easy to do. Just paint the cabinets white…again…and add new hardware. I love the simplistic look of this kitchen, especially that lovely wooden sign above the window. Add lace curtains to really get that great cottage look. The entire room just looks so clean and inviting. Turquoise and dark wood contrast each other in this lovely kitchen. The wood flooring is stained a really dark color and the backsplash is painted turquoise. Against white cabinets, this really gives the room a larger look, so it would be great for smaller kitchens. Also, this is another one where all you’re doing is buying paint and stain, so it’s relatively cheap and won’t take long to accomplish. Note how the wooden countertops match the wood flooring – beautiful! I love the clean look of these white subway tiles. Plus, the décor that they’ve added is also great. The entire look is relatively easy to do and won’t cost much if you can install the tiles yourself. You’re looking at around $1,000 or so if you have them installed, but that includes the materials, so that’s not terrible for a complete kitchen redo, right? This old cottage kitchen got a wonderful updo with some white cabinets and splashes of bright yellow. I love the yellow chandelier, which you can totally make yourself. Just get an old chandelier and spray paint it. I also love that kitchen island with its marble top and drawers that really resemble and old apothecary table. There’s so much clean white in this that the splashes of yellow really stand out. This great kitchen has a wonderful industrial feel and a French kitchen feel all at once. Note how there aren’t any top cabinets around the stove or sink, which gives the room a taller look. I love the white on stainless steel. It gives the entire room such a clean, organized feel. You can paint your cabinets and add stainless appliances to get this look, and remove top cabinets if you don’t need them to make your room look much bigger. The cottage look is very popular for kitchens, and here is another one. In this kitchen, they’ve painted the island and bottom cabinets blue but left the shelves and countertops white for a nice contrast. I love the island embellishment, which you could make yourself out of a wooden sconce. Little splashes of blue throughout complete the look. 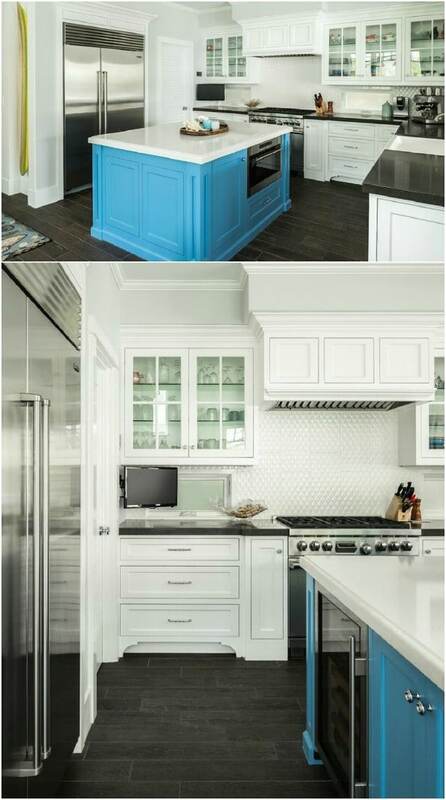 In keeping with the blue look, here’s a great pastel kitchen that’s a bit backwards from the others in the list. Instead of painting cabinets blue, the walls and backsplash have been given a new coat of pastel paint. The cabinets are painted white and the white island table and chairs really pulls it all together. You can easily get this look with just a few gallons of paint and a weekend’s worth of work. 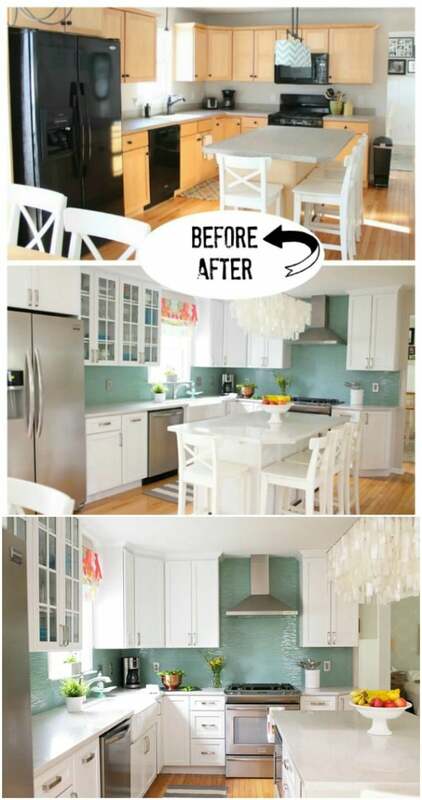 So in this remodeled kitchen, they painted the island turquoise to make it stand out – sort of like a statement piece. The thing is, adding an island is a great way to change up your kitchen. If you don’t already have one, there are tons of ways that you can create your own kitchen island without spending a fortune. Then paint it a contrasting color and see just how much it changes the entire room.